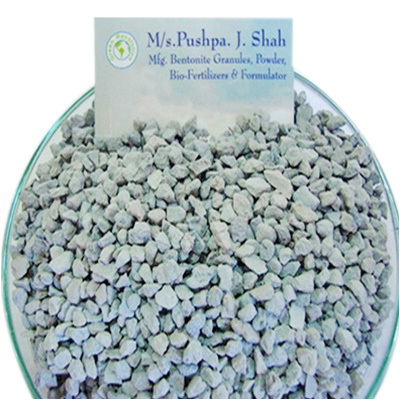 What is It: These are granules made from selected pure stone free Bentonite clay. Uses: They are widely used as carrier in formulation of pesticides, herbicides, fungicides, bio-pesticides, Plant growth promoter and Bio-fertilizers. Apart from filler, it also benefit as natural soil conditioner. Proprieties: It is soft clay, it loosens the soil and allows air as well as other nutrients to reach the roots. If it is mixed with seed while sowing it soften the soil near the seed and help the new roots to grow. On coming in contact of water it immediately allow the formulated to release in soil. It is a low cost but natural friendly product. Liquid holding Capacity: Free flowing at 7 % mass by mass. Packing: Second hand HDPE bags.